August | 2018 | One Aloha Shave Ice Co. Originally, under our first Official company, Ke Anuenue Shave Ice, we were selling Ready To Use or RTU shave ice syrups in our 8×12, 6.700lb steel commercial shave ice trailer up in South Kona. Syrups that have a long shelf life and do not need to be kept in a refrigerator. This particular brand was the brand my mother used and was and still is very popular with locals and visitors. Although this local RTU brand uses natural flavors and natural cane sugar, it did use artificial food coloring and high fructose corn syrup as well as refined white sugar. After a few months, I began to hear customers comments on how all the flavors began to taste the same…mostly just super sweet. This was concerning for me so on my down time in the trailer I began to read and research the health impacts of artificial food colors, refine white sugar and High Fructose Corn Syrup. The more I read, the more I became disturbed to the point of needing to stop the use of RTU’s. 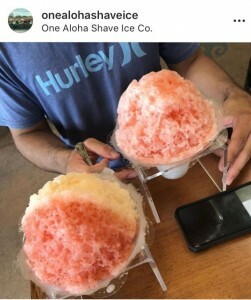 After selling RTU’s for 6 months, and knowing how harmful RTU syrups were to our health (especially to our kids) I could no longer serve Hawaii’s popular and nostalgic shave ice treat. So I told Leilani, my spouse, we need to do something different and go organic!!! We eventually sold our trailer and found a sweet small shop at the King Kamehameha Mall. It was there that my sweeet Leilani’s began creating the first real fruit flavor -Strawberry and so many more of her magical refreshing flavors -manifesting our dreams to “serve aloha, one organic shave ice @ a time”. Now you can enjoy organic & all natural shave ice flavors! 100 % Artificial FREE Shave Ice Syrups! Your health is very important to us! We are committed to serving only certified organic & local pesticide free fruit flavors and as needed colored with all natural food colors such as our Blue Vanilla colored with Spirulina! Photo: Strawberry & Lilikoi (passion fruit) Combo!